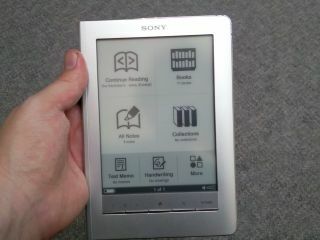 Sony Reader Touch - but does it have healthy competition? The failure of companies like Amazon to release eBook readers in the UK could be inhibiting the market, according to the latest research from YouGov. An in-depth study of owners and potential buyers of eBook readers suggests that the presence of only one major manufacturer in the British eReader market – namely Sony – seems to be affecting the UK industry. A weighty 65 per cent of potential eBook reader buyers were aware of Sony, but with Amazon (42 per cent) and Apple (35 per cent) the other two main manufacturers that these people were aware of, consumers may perceive that competition is scarce. Of course, Apple has not produced an eBook, the Amazon Kindle is not yet out in the UK, and awareness of the likes of Elonex/Borders' eBook and BeBook was low. "Whereas the first wave of purchasers are early technology adopters, what YouGov characterises as the "Tech Vanguard", the second wave of purchasers, those likely to purchase in the run up to Christmas, are more likely to be younger, female and less tech savvy than current owners", said Caroline Gaskin, Consulting Director at YouGov. Sony has recently announced another two of its Reader devices for the UK, although it is not releasing a third which brings 3G connectivity, explaining to TechRadar that the British eBook market was 'too immature'. "The lack of products from Amazon and Apple may inhibit this market in the short term," continues Gaskin. "Prospective Apple purchasers are focused on style with prospective Amazon purchasers more interested in the range of e-books available. "There is a misplaced association in future purchasers' minds between the arrival of the Kindle and the delivery of the full Amazon catalogue to the hardware. "Sony prospects are focused on the reputation of the company and the style of their products." The research programme was called The E-Reader Experience, a quarterly multi-client research programme launched by the Technology and Telecoms Consulting division at YouGov, and the survey sample was 318 owners of electronic readers and 784 'intenders'.